When a stepped or staggered gable abutment is formed the status of the external skin below the roof line changes to that of an internal skin. Accordingly, every gable abutment must be constructed so as to prevent dampness and rainwater from penetrating below the abutting roof line. The Keystone gable abutment cavity tray forms a stepped cavity DPC which is incorporated into the building during bricklaying. The completed structure is ready to receive roof lead flashing in the conventional way. Manufactured from polypropylene, the Keystone gable abutment cavity tray is available in three sizes to suit all roof pitches up to 60°. It is suitable for use in all brick, block and timber-framed constructions, the large bridging piece catering for cavity widths from 50mm to 100mm. 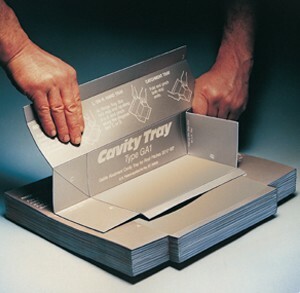 Supplied flat, the pre-creased cavity trays allow for easy on-site folding to the required shape – catchment, left and right hand or ridge tray. A locating lip facilitates the accurate placement of trays during bricklaying. The single-element system makes the calculation of quantities very simple. Whether you are building with bricks or blocks the rule is the same: you require one cavity tray per course per slope. On a double slope roof this calculation will give you an extra tray that can be used to lengthen the ridge tray if required. The Keystone gable abutment cavity tray is available in three sizes. Trays are supplied in shrink-wrapped flat packs in the quantities indicated or as single items. Note: All packs contain full installation instructions and folding instructions are printed on each tray. Flat-packed foldable corners complete the Keystone gable abutment cavity tray system. Both internal (GAIC) and external (GAEC) corner trays comprise factory-jointed two-piece assemblies that are folded on site to form right-angled corners. The trays are pre-creased and incorporate adjustment for 50mm, 75mm or 100mm cavity widths and incorporate mastic sealant strips for overlapping areas.